Gaia Trussardi is taking the Trussardi woman through a wind torn journey across the western Australian deserts. 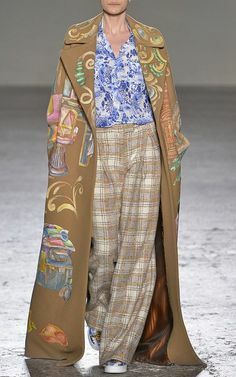 Robyn Davidson was her source of inspiration evident in the sun torn colors of colossal trousers, easy blouses and jackets, and high slit wrap skirts. The breezy, wind-whipped collection is certainly felt – see the full show above.